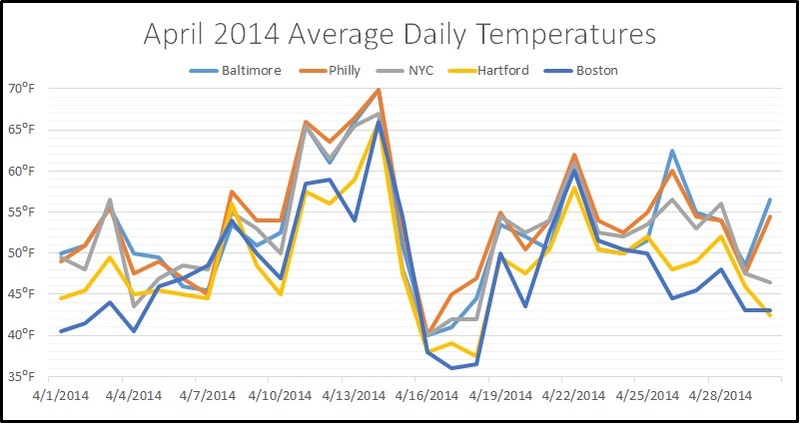 Spring months are noted for having drastic swings in both temperature and precipitation and April 2014 was certainly no exception. The Northeast experienced everything one would expect in a typical spring month including the first warm spell of 70s and 80s, one last blast of winter and even a major flooding event that ranks this April among the wettest on record. 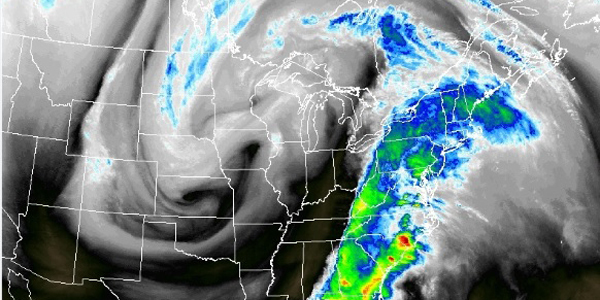 Let’s take a look back at the variety of weather the Northeast endured over the past month. The first week of the month featured textbook spring conditions as a few dreary, wet and chilly days were balanced out by pleasantly mild and sunny days. After 0.50 – 0.75 inches of rain fell on the 7th, a much appreciated stretch of warmth and dry weather took place from April 8th – 14th. Temperatures climbed into the 70s on consecutive days throughout the I – 95 corridor, the first time since October 2013, with even a few spikes into the 80s in the Mid - Atlantic. Interestingly, this event broke both daily snowfall and low temperature records. In fact, it was the first time Bridgeport, CT ever saw measureable snow on April 16th! The 0.3 inches of snow and low temperature of 27 degrees in Allentown, PA surpassed the previous records for the day which had stood since 1978 and 1962, respectively. After the snow, frigid air lingered through the 18th with temperatures staying 10 - 15 degrees below average. This also included consecutive nights of freeze warnings spanning from New York City through Maryland. The graph below illustrates the drastic swing in temperature observed over this period. Temperatures rebounded nicely into the 60s and 70s from the 19th to 28th with a few more rain events mixed in before a deluge hit for the final days of the month. An upper level disturbance over the Midwest pumped a plume of moisture rich air out of the Gulf of Mexico into the Northeast from April 29th – May 1st (see visible satellite image below). This, combined with a slow moving frontal boundary, brought together the necessary ingredients for a widespread flooding event, mainly from the Mid - Atlantic into the New York City metro area. Periods of heavy rain and embedded thunderstorms bombarded the area for nearly 2 days leading to rainfall totals of 3 – 6 + inches. This event alone exceeded the normal rainfall for the entire month of April! For more information on this rain event, click here. Visible satellite taken April 30 2014. 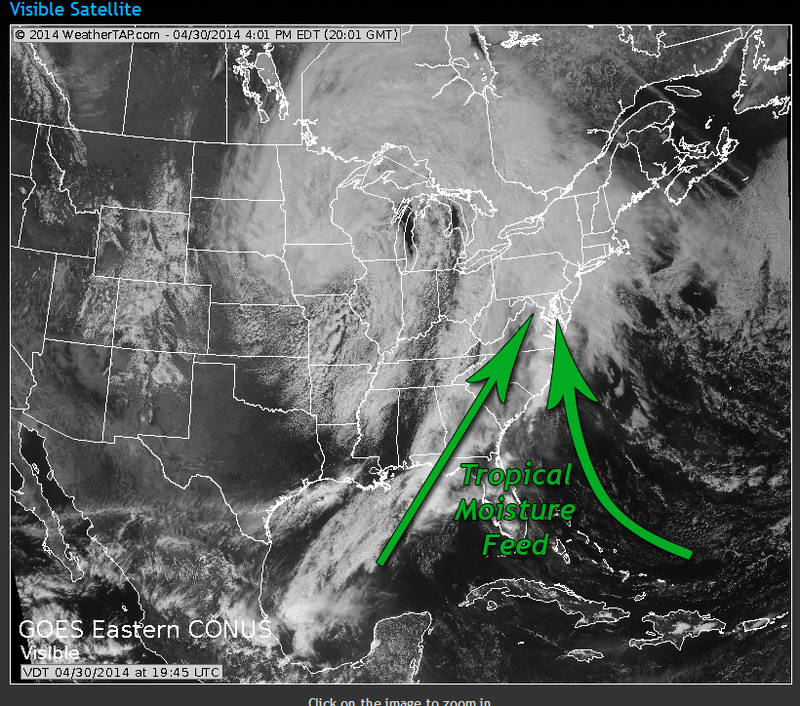 Notice the plume of tropical moisture stretching from Gulf of Mexico into the Northeast. The highlight of April 2014 for areas south of New England certainly was the exceptionally high rainfall. As the chart below shows, many from the Mid - Atlantic through the New York City metro area rank the month within their top 10 wettest Aprils on record. In fact, it was wettest April ever in Baltimore's 75 year weather history! Check out the listing below to learn how your location ranked for the month.